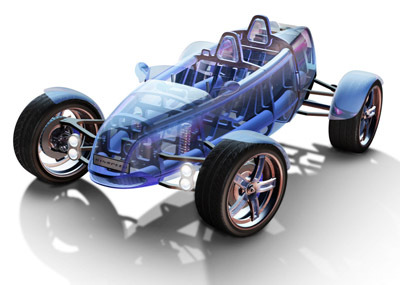 The eXasis concept from Swiss sports car tuners and concept car makers Rinspeed, is an unusual tandem seating roadster characterised by a transparent plastic body, including the floor. 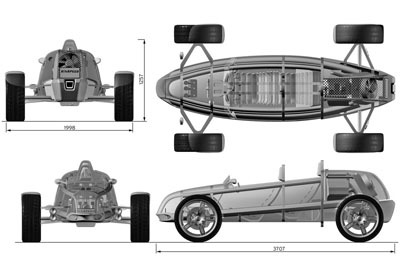 The Rinspeed eXasis has a cigar-shaped body and styling elements of the legendary Auto Union race cars from the first half of the last century combined with a modern Baja-1000 off-road vehicle. 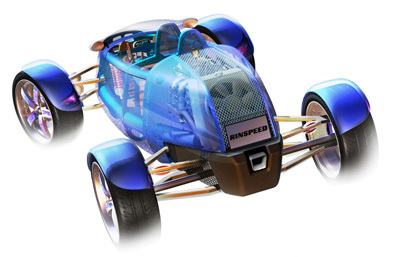 The Rinspeed eXasis concept is powered by a compact and powerful two-cylinder 750-cc engine providing 150 horsepower. Using bioethanol fuel reduces CO2 emissions from the tiny supercharged engine. With a projected vehicle weight of just 750 kilograms, thanks to the plastic lightweight construction, each of the eXasis concept's horsepower has to account for just five kilograms.